English ivy (Hedera helix) is the most popularly grown species of ivy and encompasses a wide range of cultivated varieties. English ivy plants typically have two-toned or variegated leaves that are attractive and ornamental. These ivies are often grown to climb on structures like walls, fences and arbors, but they’re also grown indoors as houseplants. Ivies can also be shaped to grow as topiaries on wire forms. English ivy vines are easy to train and care for, growing vigorously and rapidly if given the right care and growing conditions. Water your English ivy to thoroughly wet the soil around the roots once or twice each week during dry spells or droughts. Feed your English ivy plants once in spring, once in summer and again in fall during the first year after planting them with a 12-4-8 or 15-5-15 NPK formula fertilizer, according to the dosage recommended on the label. 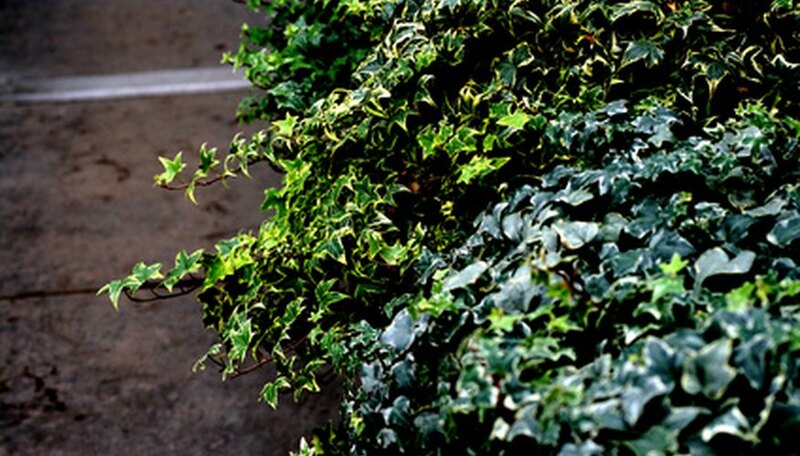 After the first year, fertilize the English ivy twice each year in spring and again in autumn. Mulch around the English ivy to control weeds and keep the soil cooler, spreading a 2- to 4-inch-deep layer of organic mulch around the plants. Keep the mulch around the English ivy plants for the first one or two years, until the plants grow to create a dense mat. Trim the English ivy to keep it within the planting bed and hand-pull any ivy vines that have rooted outside of the bed. Trim the English ivy stems to control their growth direction when they’re climbing on support structures, such as walls, fences, trellises or arbors. You can perform all pruning from spring until fall, when the English ivy is actively growing. Position your indoor English ivy in bright, indirect or filtered light, but don’t place the plants in direct sunlight or beside a south- or west-facing window. Water your English ivy plants when the topmost layer of potting soil feels dry to the touch, pouring water into the soil until it begins to drain from the bottom of the pot. Don’t allow the lower layers of potting soil to dry out or allow the English ivy to sit in water that remains in the drainage dish. Feed your indoor English ivy plants once every two months with 1 tsp. of water-soluble 20-20-20 NPK formula fertilizer dissolved in 1 gallon of water. If more than 10 percent of the water drains out of the container, fertilize the English ivy once each month. Trim back the English ivy stems as desired to shape the ivy or control its growth. You can repot the English ivy plants when their roots begin to crowd the pot if you want the plant to grow larger. Plant your outdoor English ivy in freely draining, loose soil that doesn't become soggy or waterlogged. Select a location in partial sunlight, with some protection from the hot afternoon sun. If you live in a region with hotter summers and mild winters, plant the English ivy in partial to full shade. Watch out for aphids, mealybugs, mites and whiteflies infesting your English ivy plants. Apply an approved insecticidal soap or spray to your English ivy plants to control the infestation, or consult your local agricultural extension office for a proper treatment.